"Does Mark 16:9-20 belong in the Bible?" The church has answered "Yes" for centuries. Many in the church still do. But in the 1800's, scholars questioned the originality of these 12 verses. Many scholars today take it for granted that the Gospel of Mark originally did not contain this passage. Its style and vocabulary seem somewhat abnormal. And the transition from Mark 16:8 to 16:9 is more like a non-transition. Furthermore, the two oldest manuscripts of Mark 16 – Codex Vaticanus (from about 325) and Codex Sinaiticus (from about 370) – do not contain these verses. Most modem Bible translations give special treatment to the Long Ending. Some just add a footnote about the manuscript-evidence. Some bracket the passage. The original edition of the Revised Standard Version (1952) placed the passage in a footnote. Some present the Long Ending (found in about 99.5% of all Greek manuscripts) and another ending (the "Short Ending," which is in six Greek manuscripts). Now when he had risen early on the first day of the week, he appeared first to Mary Magdalene, from whom he had cast out seven demons. She went and told those who had been with him, as they mourned and wept. When they heard that he was alive, and had been seen by her, they disbelieved. After these things he was revealed in another form to two of them, as they walked, on their way into the country. They went away and told it to the rest. They didn't believe them, either. Afterward he was revealed to the eleven themselves as they sat at the table, and he rebuked them for their unbelief and hardness of heart, because they didn't believe those who had seen him after he had risen. He said to them, "Go into all the world, and preach the Good News to the whole creation. He who believes and is baptized will be saved; but he who disbelieves will be condemned. These signs will accompany those who believe: in my name they will cast out demons; they will speak with new languages; they will take up serpents; and if they drink any deadly thing, it will in no way hurt them; they will lay hands on the sick, and they will recover." Here is a brief examination of external evidence cited in the United Bible Societies' Greek New Testament (fourth edition) as not containing Mark 16:9-20. Codex Vaticanus does not contain Mark 16:9-20, but following Mark 16:8 and preceding Luke 1:1 it contains an entire blank column, a feature which occurs nowhere else in Vaticanus in the New Testament. The blank space between Mark 16:8 and Luke 1:1 in Vaticanus is NOT long enough to contain Mark 16:9-20 (unless one were to write the text more compactly than the copyist usually did); nevertheless the blank column probably indicates that the copyist of Vaticanus was aware of the existence of Mark 16:9-20, but his master-copy ("exemplar") of Mark did not contain them, so he made an almost-correct guess as to how much space should be left in the event that he, or the eventual owner of manuscript, later acquired them and wished to include them. This is a hand-made replica of the last page of Codex Vaticanus. The verse-numbers in the margins are not present in the manuscript; I added them for the sake of convenient reference. In Vaticanus the text ends in the middle column, and is followed by an ornamental line and, further down, the subscription "KATA MARKON" ("according to Mark"). The third column is blank. I inserted the text of Mark 16:9-20a in the blank space immediately following the end of 16:8, since the subscription and ornamentations were probably added by a different copyist. As you can see, the text of the Long Ending of Mark does not fit into Vaticanus' blank space when written like the preceding text. Four more lines are required to contain the remaining 67 Greek letters in 16:20. It would not be difficult to fit the Long Ending into the blank space by writing the text more compactly and slightly extending the line-length of column three, although this would slightly mar the symmetry of the page's format. As shown by the picture to the left, the space in the second column after the end of 16:8 would be exactly the right amount in which to place the Short Ending. This may suggest that the reason why Vaticanus looks the way it does at the end of Mark is that (a) the exemplar of Vaticanus contained the Short Ending, and (b) the copyist of Vaticanus rejected the Short Ending, and (c) the copyist guessed -- incorrectly, but off by only four lines -- that the remaining blank space in the second column, plus all of column three, would be adequate for the Long Ending. Thus the copyist formatted the text in such a way that either ending could be adopted by the manuscript's eventual owner. It may be worth noting that in Mark, the Vaticanus has 42 lines per column, but the first 344 pages of Vaticanus have 44 lines per column (according to T.C. Skeat in Journal of Theological Studies, Oct. 1999), though the size of the columns remains the same (i.e., on pages 1-344 the lines are each slightly less tall). If a copyist were to make a calcuation of the space required for Mark 16:9-20 using a 44-line column (in which the letters would tend to be slightly smaller, resulting in a slight increase in the number of letters per line), the blank space would feasibly be adequate to include the passage. As you can see, column 9 contains only 552 letters (significantly less than the typical amount of about 635). Columns 11-16 (containing Luke 1:1-56) are all written in compressed script; in those six columns the average column contains 691 letters. This suggests that the cancel-sheet was made because the original pages featured an accidental omission of text in Luke 1. That still does not explain why the text is compacted in column 4 and in the first 10 lines of column 5. One theory is that the person who made the cancel-sheet began by using an exemplar which contained the Long Ending, and as he was writing column 4, he sensed that something was amiss, so he began to compact the text so that the Long Ending would fit, but then (at the beginning of Mark 15:19) he consulted the exemplar used by the original copyist, and realized that it did not contain the Long Ending. He had to stretch the text of Mark from that point on, in order to avoid leaving a blank column between Mark and Luke. Another theory is that the cancel-sheet's maker initially planned to begin the text of Luke in column 10, and compressed the text of Mark for that reason (i.e., so as to end Mark's text in column 9). Then he changed his mind, preferring to compress Luke's text within six columns rather than to stretch it for seven columns, with the result that he had to stretch the text of Mark from 15:19 onward (especially in column 9) to avoid leaving a blank column between Mark and Luke. However, this does not explain why, if the cancel-sheet's maker initially planned to begin the text of Luke in column 10, he did not start the text-compression immediately in columns 1-3. Note: bold-print letters in the replica indicate the presence of textual variants. A comparison of Vaticanus and Sinaiticus shows that in Mark 16:3-8, 10 out of 33 lines in Vaticanus begin at the same point as lines in Sinaiticus. This may be coincidental. Or it may suggest that their copyists liked to preserve the format of their exemplars when it was feasible, in which case this may support the view that the exemplars of Vaticanus and Sinaiticus were closely related. Note: the full ornamentation at the end of Mark 16:8, which is a significant feature, is not included in this replica. The Bible Manuscripts Project has, among other things, a pseudo-facsimile of the New Testament portions of the Sinaiticus. In Codex Sinaiticus, the four pages on which the last part of Mark (14:54-16:8) and the first part of Luke (1:1-56) are written constitute a cancel-leaf (to picture this, think of a four-page church bulletin, folded in the middle). That is, they are not the pages written by the copyist who wrote the surrounding text of Mark and Luke. Someone (probably the scriptorium-supervisor who oversaw the production of the codex) removed the original pages, re-wrote the text they contained, and then inserted the new, re-written pages. Why? It was NOT to remove Mark 16:9-20. A statistical analysis of the capacity of the 16 columns on these pages shows that they did not have room for the contents of Mark 16:9-20 (unless the copyist "compacted" the text). Possibly the main copyist accidentally skipped from the end of Luke 1:4 to the beginning of Luke 1:8, omitting Luke 1:5-7, and the supervisor decided that the best way to fix this mistake was to replace the entire four-page sheet. But whatever the reason was, the relevant implication is that when we look at Sinaiticus we are probably not looking at the text that was in the main copyist's exemplar; we are probably looking at the text that was in an exemplar used by the supervisor. Furthermore, the text in the fourth column of the replacement-page (and the first 10 lines of the fifth column) is "compacted," which may suggest that the supervisor accessed -- but abandoned at 15:19 -- an exemplar which contained Mark 16:9-20. If the supervisor had continued to write the cancel-leaf the way he wrote column four, the full text of Mark 14:54-16:20 could fit on the replacement-page with room to spare, along with the text from Luke 1:1-56. The supervisor who made Sinaiticus' replacement-pages seems to have been closely associated with the same scriptorium which produced Vaticanus. One of several indications of this is that the ornamental decoration at the end of the Gospel of Mark in the cancel-leaf in Sinaiticus is remarkably similar to an ornamental decoration at the end of Deuteronomy in Vaticanus. So the evidence from Vaticanus and Sinaiticus, while ancient and valuable, attests only to one narrow channel of the text's transmission. A side-by-side comparison of Sinaiticus' ornamentation in Deuteronomy and Vaticanus' ornamentation in Mark can be seen at the Colophons by W. Wilker. All that had been told to them, they told to Peter and his companions. And after that Jesus Himself [appeared to them and] and sent out through them, from east to west, the sacred and imperishable proclaimation of eternal salvation. Amen. It is understandable that Bohiensis and the other manuscripts which contain the Short Ending have been seen as indications of the earlier existence of a text which ended at 16:8. That is, since the Short Ending is definitely not original, it seems logical to suppose that manuscripts which contain it are descended from at least one earlier manuscript which ended at 16:8. Not only does the vocabulary of the Short Ending weigh in heavily against Markan authorship, but the textual "genealogy" of most of the manuscripts which contain the Short Ending may be plotted back to the channel of transmission which contains the abrupt text. Besides Vaticanus, Sinaiticus, and Bohiensis, the other ancient manuscripts which do not include Mark 16:9-20 are the Sinaitic Syriac (a manuscript attesting to an early Syriac translation, found at the same location where Codex Sinaiticus was discovered) and a Sahidic (Coptic-Egyptian) manuscript housed at Barcelona. These manuscripts do not significantly extend the range of the channel of transmission in which Mark 16:9-20 was not included in the text of the Gospel of Mark. Possibly the Old Latin manuscript Codex Vercellensis (from about A.D. 365) originally did not contain the Long Ending, but because it is in a rather mutilated condition it is hard to tell one way or the other. The producer of Vercellensis --Eusebius of Vercelli -- is known to have visited Alexandria, Egypt, where he may have encountered the text-channel containing the abrupt text or the Short Ending. Now about the evidence from early church writings. Some commentaries (echoing the UBS Textual Commentary, which echoed the research published in 1881 by Westcott & Holt) list Clement of Alexandria and Origen as witnesses against Mark 16:9-20. This, however, is an argument from silence which carries little if any weight: Clement similarly did not quote from Matthew 28, and Origen did not make much use of the Gospel of Mark. Clement may have mistakenly preferred spurious works such as the "Preaching of Peter" over the Gospel of Mark. Also, Origen may allude to Mark 16:18 in Against Celsus VII:17. Some commentators have stated that Eusebius of Caesarea (not Eusebius of Vercelli) wrote in the early 300's that the Long Ending was absent from almost all copies of Mark known to him. However, a close examination of Eusebius' work Ad Marinum reveals that he presented his comment about "the most accurate copies" and "almost all the Greek copies" lacking verses 9-20 as one of two hypothetical responses by which one may resolve a question of how to harmonize Mark 16:9 with Matthew 28. Eusebius proceeded to show, in the same writing, that a harmonization between Mark 16 and Matthew 28 is possible by punctuating Mark 16:9 a certain way. This means that when Eusebius wrote Ad Marinum, he acquiesced to the inclusion of Mark 16:9-20, for there would otherwise be no reason to show how it could be harmonized with Matthew. The most that can be legitimately deduced from Eusebius is that he was aware that some manuscripts did not contain Mark 16:9-20, and that he was aware that some individuals had difficulty harmonizing the passage with Matthew. Jerome also is cited as a witness against the Long Ending. However, when Jerome produced the Vulgate Gospels (A.D. 383/384), he included the Long Ending. And his Epistle 120 (Ad Hedibiam), which is the basis for the claim that manuscripts known to Jerome lacked the Long Ending, is an edited translation of Eusebius' Ad Marinum (even some of the questions are the same); it is not an independent assessment of the manuscript-evidence. Furthermore, in Against the Pelagians 2:15, where Jerome quotes an interpolation (the "Freer Logion"), he locates it as occurring after the text of Mark 16:14, and states that the interpolation is present "in some copies, especially Greek codices," which means that verses 9-20 were in those copies also. In Jerome's Preface to the Four Gospels, he describes the kind of manuscripts he used as the basis of his work. Hesychius and Sevens are cited as evidence for the abrupt text, but this is feathery evidence because (as John Burgon demonstrated rather conclusively in 1871) the writing attributed to Hesychius and Sevens, like Jerome's Ad Hedibiam, was a re-presentation of the contents of Ad Marinum. (Burgon also showed that one composition has been erroneously attributed to both of these individuals.) If Hesychius or Sevens wrote today, he could be convicted of plagiarizing Eusebius' Ad Marinum. There are a few other witnesses against the Long Ending, but (except for early Armenian manuscripts, which I will describe later) they are feathery compared to the evidence just cited, and in the interest of brevity I will overlook them in this summary. Several commentaries (and footnotes in some Bible translations, such as "The Message") state that the Long Ending is found only in late manuscripts. That statement is false. The two earliest manuscripts of Mark 16 do not contain 16:9-20, but there are several other ancient manuscripts which contain these verses (such as Codex Washingtonensis, Codex Alexandrinus, and Codex Ephraemi). Furthermore, the abundance of manuscripts which contain the Long Ending implies the earlier existence of their ancestors. Also, the earliest known copy of Mark -- p45, from about A.D. 225 -- is damaged (and for this reason is missing all of Mark 16) but its closest textual "relative" in Mark is Codex Washingtonensis (from ch. 6 on), which softly suggests that p45 originally contained the Long Ending. They excused themselves, saying, "This age of lawlessness and unbelief is under Satan, who does not allow, through the unclean spirits, the truth and power of God to be understood. So then, reveal your righteousness now," they said to Christ. And Christ told them, "The years of the reign of Satan are ful- filled, but other terrors approach. And for those who have sinned I was delivered unto death, that they might return unto the truth and sin no more, so that in heaven they may inherit the spiritual and incorruptible glory of righteousness. But …""
Of all undamaged Greek copies of the Gospel of Mark (and there are over 1500), two (or possibly three) can be shown to have not contained Mark 16:9-20 when they were made. However, this numerical avalanche in favor of the inclusion of the Long Ending is not as important as the evidence which shows the Long Ending's presence in different text-types. Sinaiticus and Vaticanus are both Alexandrian manuscripts (Vaticanus may be considered "Proto-Alexandrian"). Other Alexandrian manuscripts contain the Long Ending. So do Western, Caesarean, and Byzantine manuscripts. They may be likened somewhat to four branches in a family tree of the text. A variant found in only one branch is generally more likely to have originated there than a variant found in all four branches. Furthermore, the evidence from manuscripts must be weighed alongside the evidence from patristic writings -- the writings of leaders in the early church. There are several quotations of, or references to, the contents of Mark 16:9-20 which pre- date Vaticanus or are nearly contemporary to it. Justin Martyr, who died in A.D. 165, wrote in his First Apology ch. 45 that the apostles "going forth from Jerusalem, preached everywhere." The three words in red here represent three Greek words identical to Greek words used in Mark 16:20, including the somewhat rare word pantachou. A comparison of this paragraph of Justin's work shows that it is highly likely that he was borrowing his terms from the Long Ending. Irenaeus wrote in Against Heresies (about A.D. 185), Book III, 10:5-6, "Also, towards the conclusion of his Gospel, Mark says: 'So then, after the Lord Jesus had spoken to them, He was received up into heaven, and sitteth on the right hand of God." This is clearly a quotation of Mark 16:19. Papias, a writer in the early-mid 100's, recorded that Justus Barsabbas (the individual mentioned in Acts 1:23) once drank a poisonous drink and suffered no ill effects. (This is preserved by Eusebius of Caesarea and by Philip of Side). His motivation for mentioning this story may have been to provide an example of the fulfillment of Mark 16:18. At the seventh Council of Carthage in 256, a bishop named Vincentius of Thibaris said, "We have assuredly the rule of truth which the Lord by His divine precept commanded to His apostles, saying, 'Go ye, lay on hands in My name, expel demons.' And in another place: "Go ye and teach the nations, baptizing them in the name of the Father, of the Son, and of the Holy Ghost.'" Vincentius' second quotation is from Matthew 28:19. Despite attempts by some interpreters to connect the first quotation to Matthew 10:8, the references to going, laying on hands, expelling demons, and doing so in My name add up to a reference to Mark 16:15- 18, especially when placed side-by-side with the parallel passage from Matthew. Either Porphyry (an early opponent of Christianity who died in A.D. 305) or Hierocles (a student of Porphyry, writing in the very early 300's) was cited by another writer (Macarius Magnes) as having used Mark 16:18 as one of several examples of weaknesses in Christian teachings. Aphraates (also known as Aphrahat), writing no later than 345, quoted clearly from the Long Ending in Demonstration One: Of Faith, stating, "And again He said this: 'This shall be the sign for those that believe; they will speak with new tongues and shall cast out demons, and they shall lay their hands on the sick and they shall be made whole.'" Eusebius and Marinus (c. 330?) both reflect knowledge of the existence of the Long Ending, in Eusebius' work Ad Marinum. Ursinus, in "Rebaptism" Part 9, strongly alluded to Mark 16:14. Ursinus wrote in about 350. The testimony of "Rebaptism" may be earlier, though; he may have been repeating a composition made in the previous century, around the the time of Cyprian. Augustine, who died in 430, used Mark 16:9-20 in Easter-time sermons, showing that by the early 400's the Long Ending was established in the lectionary in North Africa. Ambrose, who died in 397, used the Long Ending as Scripture (one example is his use of Mark 16:18 in his work The Prayer of Job and David). Besides these writers, it is believed by many scholars that Tatian included the long ending in the Diatessaron, a harmony of the Gospels made in about A.D. 175. Another second century composition which seems to reflect its author's familiarity with the Long Ending is the Epistula Apostolorum. Thus the earliest evidence for the inclusion of Mark 16:9-20 pre-dates the earliest evidence for its non-inclusion. Also, the evidence for patristic use of the Long Ending is spread over a broad geographical area: Justin (in Rome), Irenaeus (in Gaul [France]), Eusebius (in Caesarea [in Israel]), Vincentius (in North Africa), and Tatian and Aphraates (in Syria). Against this, the ancient Greek evidence for non- inclusion is confined to Egypt (and Caesarea, but this is because the library at Caesarea included Egyptian manuscripts). The implication of this is that copies of Mark containing the Long Ending were in use at all these locations. And the blank column in Vaticanus suggests that the Long Ending was known in Egypt also. Some evidence from early translations -- especially the Gothic, Old Latin, Syriac, Armenian, and Coptic versions -- may be considered here. Profiles of the ancient versions at "Versions of the New Testament." The Gothic version is known to have been translated by Wulfilas (who was originally from Antioch) in about A.D. 350. Manuscript-evidence for the Gothic Version is sparse, but it displays the Long Ending. Quite a few Old Latin manuscripts are damaged, but all undamaged Old Latin manuscripts of Mark 16 except Codex Bobiensis contain the Long Ending. The Syriac evidence is divided: the Sinaitic Syriac manuscript ends the text of Mark at 16:8; the Curetonian Syriac manuscript is mutilated but preserves part of the Long Ending (the only part of Mark in the manuscript!). The Peshitta Syriac Version (made some time before A.D. 400) contains the Long Ending. Valuable information about the Armenian manuscripts may be found in E. C. Colwell's essay "Mark 16:9-20 in the Armenian Version" in the 1937 Journal of Biblical Literature. Read and view ornate illustrations in Armenian manuscripts. The Coptic versions are divided. The earliest manuscript of Mark in the Sahidic Coptic version (which is probably the earliest Coptic translation) does not have the Long Ending. The next "layer" in the Sahidic tradition has both the Short Ending and the Long Ending. Then the Long Ending dominates, fully included without the Short Ending. This is what one would expect in a textual tradition which was influenced, in turn, by the Alexandrian Text, the Caesarean Text, and the Byzantine Text. For any manuscript of Mark, the less it is connected with the early Alexandrian channel of textual transmission and the Caesarean channel related to it, the more strongly it supports Mark 16:9-20. The same thing is true of patristic testimony and versions. This suggests that the loss of these twelve verses occurred either in, or en route to, Alexandria, perhaps sometime late in the second century. See the supplement: Sixty-Four Early Witnesses. Why Doesn't the Early Alexandrian Text Contain This Passage? Although some witnesses cited against the inclusion of Mark 16:9-20 are practically weightless, it is evident from Vaticanus, Sinaiticus, the earliest Sahidic evidence, and from Eusebius that some manuscripts produced in the 200's and 300's in Egypt (some of which were taken to Caesarea) did not contain Mark 16:9-20. Why not? In the past, it was claimed that some major Ethiopic manuscripts omit Mark 16:9-20. However, that claim is not true. In a scroll that was not re-wound after reading, the last part of the book was most vulnerable to damage. Disseminated in book-form, the last page was vulnerable to damage. Some manuscripts of the Gospels arrange the Gospels in the order Matthew-John-Luke-Mark (so that the apostles' Gospels were placed first). In this order, the last page was vulnerable to damage. A copyist wrote the last 12 verses on the last page of a book, and that page was accidentally damaged or lost. This accounts for the initial loss of the passage in one manuscript. This manuscript, used as an exemplar in the second century somewhere in Egypt, was the ancestor of all manuscripts which display the abrupt text (ending at 16:8). Manuscript 2386, once cited as evidence in favor of the omission of Mark 16:9-20, is simply a damaged copy. This might also be true of Manuscript 304. See The Scribal Culture of Early Christianity about mediums used. Mark, in the process of composing his Gospel account, used a variety of sources, mainly the sermons and reminiscences of Peter. Much of the material he incorporated into the Gospel of Mark was known in different forms. Mark may have written a draft of his Gospel-account in Alexandria when, according to tradition, he left that city in A.D. 62. At that point, the text may have had a conclusion resembling Matthew 28:9-10 and 28:16-20. Later, in about A.D. 68, Mark finished the Gospel of Mark and published it. Most of the differences between the finished version and the version he had left in Alexandria were minor, but there was one big difference: the published version contained the Long Ending. Another possibility is that Mark wrote the Gospel of Mark up to 16:8, and then stopped writing -- possibly because of the persecution which the church in Rome endured in the mid-60's. In this case, an associate of Mark finished the book by adding 16:9-20 (using source-materials Mark had left) and then published the book. When a copy of the Gospel of Mark reached Egypt, a copyist objected to the ending, either because it was different from the ending he was familiar with, or because he was accustomed to follow a copying-rule that dictated that only the work of the primary author should be preserved. This copyist was content to make copies which contained only the text which he felt was truly from the hand of Mark, and thus -- exercising great restraint -- he made copies which ended at the end of 16:8. But at least one of his successors was not so disciplined. Dissatisfied with the abrupt text, someone in the second century composed the Short Ending to make the conclusion less abrupt. In this way, some manuscripts entered the Proto-Alexandrian text-stream with only the Short Ending (Codex Bobiensis reflects this) but they quickly encountered other manuscripts with 16:9-20, with which they were combined. This is why the abrupt text and the double-ending appear in the same text-stream. Sinaiticus and the earliest Sahidic evidence appear to descend from the Proto-Alexandrian manuscript which featured the abrupt text. This might also be true of Vaticanus, but it is possible that Vaticanus' exemplar contained the Short Ending, which the copyist rejected (see the replica for details), recognizing that it was not original. Two of the six Greek manuscripts with the Short Ending have a "Stop Here" symbol (Ψ) after Mark 16:8. This theory is similar to, and was suggested by, John Burgon's 1871 book The Last Twelve Verses of Mark Vindicated. Another theory that involves a copyist's misunderstanding of his exemplar is also related to the division of the text into readings for the "high days" celebrated in the early church: a lector in the second century did not like the abruptness of a lection which ended at Mark 16:8, so he composed a positive-sounding liturgical flourish and wrote it in the margin of his manuscript, next to the end of 16:8. A later copyist -- one who was not acquainted with the Christian liturgy in the lector's locale -- misinterpreted the lector's note and thought that it was instructing him to replace the Long Ending with the marginal note -- which consisted of what is known today as the Short Ending. So the copies he produced had (like Codex Bobiensis) only the Short Ending. Subsequent copyists in his locale encountered some copies with the Long Ending and some copies with the Short Ending. So in that locale, some copyists chose to include only the Short Ending or the Long Ending, and some included both endings, and some -- working with exemplars which displayed the Short Ending -- did not include either ending because they knew the Short Ending was not genuine but did not have an exemplar with the Long Ending available. The oldest available exemplar was considered the one most likely to preserve the original text. Copyists on guard against additions and alterations would almost certainly regard with suspicion a text which begins with a woman in the spotlight, and then records how the apostles were sternly rebuked, and then mentions tongues-speaking, snake-handling and poison-drinking among the signs accompanying believers. This is especially probable in Alexandria, which (according to patristic writings) was a veritable hive of heretics in the late second century. The contents of the Long Ending appeared difficult to harmonize with the other Gospels to some individuals in the early church. Marinus, to whom Eusebius wrote, was one of these individuals. Quite a bit of energy seems to have been expended in the early church in the quest to harmonize the Gospel accounts -- and it may have occurred to some of them (just as it does to the apologist pictured by Eusebius) that some energy can be saved if one appeals to the manuscripts which lack Mark 16:9-20 when making a harmonization. A motive to achieve harmonization between the Gospel-accounts was not the source of the absence of Mark 16:9-20 in the Proto-Alexandrian Text. But it may have contributed to the preservation of a reading which would otherwise have been dismissed as an accidental omission. Some commentaries claim that the last phrase in Mark 16:8 ("efobounto gar") is no way to end a sentence in Greek -- implying that the rest of the sentence (and an unknown section of text which originally constituted the end of the Gospel) has been lost. That claim is false. More than a dozen examples exist in other ancient Greek writings of sentences ending in "gar." One example is in the Septuagint (a popular Greek translation of the Old Testament made c. 250 B.C.) in Genesis 45:3. In the course of an essay that favors the theory that Mark intentionally finished writing at 16:8, Kelly Iverson lists sentences in ancient Greek texts which end in "gar." Some commentators appeal to the Long Ending's style and vocabulary as evidence that Mark is not its author. When a reader is told that the Long Ending has more than 20 features which occur nowhere else in the Gospel of Mark, this evidence may initially seem to doom the theory that Mark composed the Long Ending. However, the strength of the objections based on style and vocabulary shrivels considerably when placed alongside a similar analysis of other parts of Mark which also have many unique features. Also, it seems to me that Mark was capable of more than one style: Mark is more concise than Matthew when describing Jesus' temptations, but Mark is more detailed than Matthew when describing the raising of Jairus' daughter. I do not focus on internal evidence in this essay because Dr. Bruce Terry has already done so. I highly recommend reading Dr. Terry's analysis. This objection assumes a knowledge of the motivations of the Evangelists which cannot validly be asserted with confidence. We simply do not know all the thoughts and intentions which may have been on the minds of Matthew and Luke as they composed their Gospels, or what considerations may have led to their treatments of their sources. This objection constructs a lose-lose scenario for the Long Ending: if large sections of material were shared by Matthew and the Long Ending, or by Luke and the Long Ending, an objector could say, "Notice how the Long Ending borrows material from Matthew (or from Luke)." It is possible, and perhaps probable, that Matthew and/or Luke used pre-publication drafts of the Gospel of Mark, rather than the published Gospel of Mark. The Long Ending is recognized as canonical by the Roman Catholic Church (it was affirmed as canonical at the Council of Trent in 1546), and is used in the Orthodox Church also. During the Reformation, Protestant leaders such as Martin Luther appealed to the Long Ending as Scripture. So did later leaders, such as John Wesley, Alexander Campbell and Charles Spurgeon. To some theologians, the church's longstanding acceptance of the Long Ending is a sufficient reason to regard it as canonical. To others, the original text must be determined on purely scientific grounds. With that scientific outlook in mind (and without fully resolving the question of the authorship of the Long Ending) I believe that the empirical evidence supports the view that the Long Ending was contained in the Gospel of Mark in the form in which it was first produced for distribution in the church, and that it was accepted as Scripture everywhere except in one Egyptian locale (perhaps Alexandria), where – due to an accident or a copyist's error – it was temporarily lost. Mark 16:9-20 deserves its status as a canonical text. It should be included in the text of the Gospel of Mark in translations of the New Testament. The Short Ending, however, has no right to be in the New Testament. The following chart depicts 64 pieces of evidence, all of which are texts as old or older than Codex Ephraemi ("C"), the fifth-oldest Greek manuscript of the Gospel of Mark. 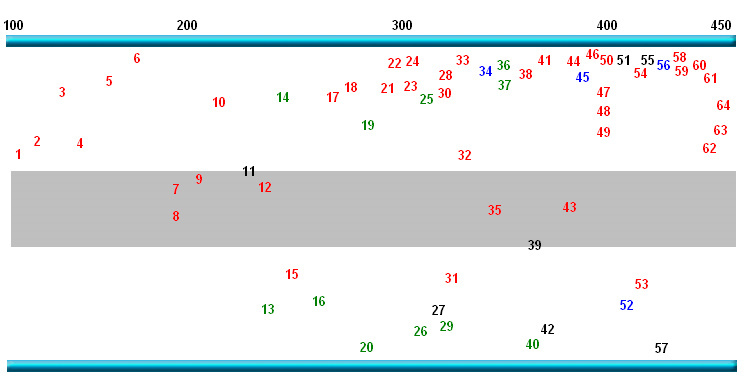 The more a witness supports Mark 16:9-20, the higher it is placed on the chart. Some witnesses which are essentially silent are placed in the grey area in the middle. Chronology is given from left (beginning at A.D. 100) to right. To see which source a number represents, just scroll down the page. Dates assigned to patristic evidence and versions are production dates. Patristic words are in red. Manuscripts (extant or mutilated) are in black. Non-extant but credibly extrapolated witnesses are in green. Early versions (attested by more than one manuscript) are in blue. Papias (died c. 110) - stated that Jesus Barsabbas once was forced to drink a noxious drink (snake venom, according to Philip Sidetes) and was not harmed -- a possible allusion to 16:18. Epistula Apostolorum (pre-150) - according to researcher M. Hornschuh, the structure of this work reflects the influence of the Long Ending. Justin Martyr (pre-165) - in First Apology, ch. 45, he used language highly reminiscent of Mark 16:20. "Gospel of Peter" (pre-150) - this unorthodox, patchwork composition refers to the disciples weeping and mourning, as in Mark 16:10. Tatian (wrote c. 172) - in the Diatessaron, a single narrative integrating the four Gospels, he used the Long Ending, as shown by the Syriac manuscript of Ephrem's Commentary on the Diatessaron, the Arabic Harmony, and other sources. Irenaeus (wrote c. 180) - in Against Heresies, Book III, 10:5-6, he quoted explicitly from Mark 16:19 and stated that the material was from the end of Mark's Gospel. Clement of Alexandria (died c. 215) - made no comment about Mark 16:9-20 in his extant works, but likewise made no explicit quotation from Matthew 28. Seems to have highly regarded a spurious work called the "Preaching of Peter" which may have used (or contradicted) material from Mark 16:9-20. Ammonius (c. 200) - known only for the harmony of the Gospels which he made, and which Eusebius later used as a model for his Canon Tables. The earliest known form of the "Ammonian Tables," having been extensively re-worked by Eusebius, should be regarded as the work of Eusebius, not Ammonius. Tertullian (c. 220) - wrote in detail about believer's baptism but never explicitly quoted Mark 16:16. However, he may have used a creed which used Mark 16:19 in Against Praxeas, and De Baptismo 10:7 might allude to Mark 16:16. Hippolytus (c. 230) - in Apostolic Tradition 32:1, he seems to have used part of Mark 16:18 when describing the positive effects of partaking of the Lord's Supper. p45 (c. 225) - this papyrus, the earliest known copy of the Gospel of Mark, is heavily damaged. A study by L. Hurtado involving a comparison of 103 readings in p45 indicated that p45's text is related to the text of Codex W, which includes Mark 16:9-20 (with the Freer Logion). Origen (died 254) - did not quote explicitly from Mark 16:9-20 in his extant works, but in Against Celsus VII:17 he mentioned that signs of the destruction of Satan's kingdom include deliverance from the power of demons; this may be an allusion to Mark 16:17. He mentions signs again at the beginning of Book VIII. 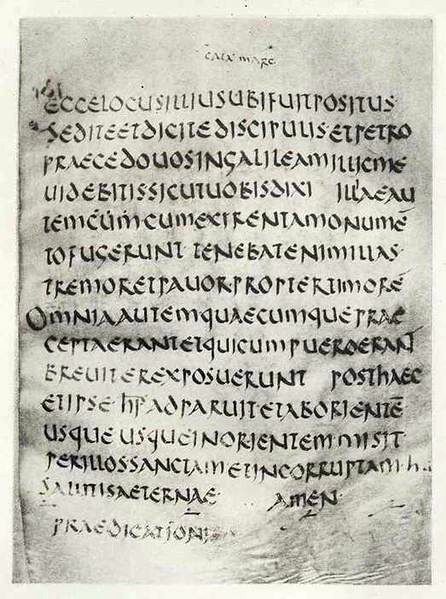 Non-extant ancestor of Codex Bobiensis (c. 250) - The text of Old Latin "k" frequently agrees with citations of Scripture made by Cyprian in the mid-200's, indicating that Bobiensis' text is, generally, from that era. Non-extant ancestors of Old Latin mss. (c. 250) - Codex Monacensis and other Old Latin manuscripts descend from texts written at or before this time. Cyprian (c. 250) - wrote a lot about baptism but never explicitly quoted Mark 16:16 in his extant works. Non-extant earliest strata of Sahidic Version (250) - since one Sahidic manuscript (the Crosby Codex) from about 300 contains First Peter, it seems fair to conclude that a Sahidic text of the Gospels was in use before that time. the Seventh Council of Carthage. Treatise on Baptism (c. 250) - this was incorporated into another work at a later time by a writer named Ursinus. Uses Mark 16:14. Non-extant copy used by the Author of the Freer Logion (pre-300) - Bruce Metzger (in the UBS Textual Commentary, p. 125) stated that the Freer Logion is "probably the work of a second or third century scribe." Non-extant ancestor of Sinaitic Syriac (pre-300) - this may be the source of several features shared by the Sinaitic Syriac and some African Old Latin manuscripts. Claromontanus Catalog - found in Codex Claromontanus after Titus, this list of books gives the line-count for each book (a line = 16 syllables). For Mark, the line-count is listed as 1,600, which according to Kirsopp Lake indicates the inclusion of Mark 16:9-20. Porphyry and/or Hierocles, as quoted by Macarius Magnes (c. 270 or 305) - The writings of Porphyry, an opponent of Christianity, were probably used by his student Hierocles, whose statements -- including a use of Mark 16:18 -- were answered later by Macarius Magnes in Apocritus. Syriac Story of Abgar (pre-300) - a source translated by Eusebius in Ecclesiastical History. Acts of John (usually assigned to c. 200; here assigned to c. 300) - this apocryphal story repeatedly uses material from Mark 16:9-20, especially 16:18. Non-extant Manuscript Known to the Copyist of Codex Vaticanus (pre-325) - the blank space after Mark 16:8 in Codex Vaticanus, as shown on another page, seems to be reserved for 16:9-20. Non-extant Manuscript Used by the Copyist of Codex Vaticanus (pre-325) - this exemplar may have contained the abrupt text, or perhaps the Short Ending. Codex Vaticanus - the earliest extant evidence for the abrupt ending. Closely associated with Codex Sinaiticus. Ad Marinum (between 290-340) - Eusebius attributed 16:9 to Mark and explained how it may be harmonized with Matthew 28:1. Eusebian Canons (between 290 and 340) - made by Eusebius, based on an earlier harmony designed by Ammonius, who, according to Dionysius bar Salibi (a medieval writer), stopped harmonizing when he came to the resurrection-accounts. Asterius (c. 340) - cited in the UBS textual apparatus as an apparent witness for inclusion. Aphrahat (wrote 345) - used 16:16 and 16:17-18 inFirst Demonstration 17. Gothic Version (350) - made by Ulfilas, who was made bishop of Antioch in 341. Codex Vercellensis (365) - made by Eusebius of Vercelli, this Old Latin manuscript is extensively damaged at the end of Mark. Codex Sinaiticus (360-370) - possibly made at Caesarea under the supervision of Euzoius and Acacius. Apostolic Constitutions (380) - possible incorporating material from Didascalia Apostolorum, which is pre-300. Vulgate Gospels (384) - Jerome included Mark 16:9-20. He stated that he used old Greek manuscripts as the basis for his revision of the Latin text. Ambrose (390) - quotes from Mark 16:9-20 repeatedly. Didymus of Alexandria (390) - cited in the UBS textual apparatus. Jerome in Ad Hedibiam (407) - here Jerome is summarizing and repeating material from Ad Marinum. Jerome in Against the Pelagians (417) - here Jerome independently cites the text preceding the Freer Logion, and states that the Freer Logion is present in some copies, especially Greek ones. Codex Washingtonensis (c. 400-425) - includes Mark 16:9-20 with the Freer Logion between v. 14 and v.15. Peshitta (pre-430) - This, the standard Syriac Version, is carefully preserved in many manuscripts. Codex Bobiensis (c. 430) - besides including the Short Ending and not 16:9-20, this Latin manuscript's text of Mark 16 also adds an interpolation describing Christ's resurrection and ascension after 16:3, presents the angel saying that he will be seen in Galilee, and removes part of 16:8. Augustine (430) - quotes from Mark 16:9-20 repeatedly. Made some use of old manuscripts. Nestorius and Cyril of Alexandria (pre-444) - Cyril quotes Nestorius' use of 16:20. Philip Sidetes (430) - gives a description of Papias' account of Jesus Barsabbas' poison-drinking which in some aspects may be more accurate than Eusebius' account. Marcus Eremita (pre-450) - cited in the UBS textual apparatus. Theodoret of Cyrrhus (c. 450) - states that all four Gospels say that Mary Magdalene told the disciples about the risen Lord. He may also refer to Irenaeus' quotation of Mark 16:19. This list is not exhaustive; even more early witnesses could be added in support of the inclusion of Mark 16:9-20. Nevertheless this may sufficiently show that the external evidence in support of the inclusion of Mark 16:9-20 is earlier and broader than the external evidence against it. This is a summary of a much longer essay examining the external evidence for and against Mark 16:9-20, a passage known as the "Long Ending" of Mark. The complete essay, over 100 pages long, can be found at: http://www.textexcavation.com/snapp/PDF/snappmark.pdf.